Porsche has been a busy German bee as of late. Yesterday we brought you the first shots of the new 2013 Porsche 911 (991) Turbo convertible cruising around the open roads with its top down. Today we have the latest photos of Porsche&apos;s new 911 GT3 running around the German countryside. 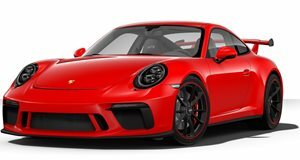 The new Porsche 911 GT3 takes its motivation from a possible 450hp flat-six mated to either a manual or PDK transmission. Both are currently undergoing testing. Upon closer inspection, it appears that there are paddle shifters behind the 911 GT3&apos;s steering wheel, meaning this mule is using a PDK. In terms of styling, the new Porsche has only a bit of camouflage on top of the rear bumper. Whether the camo is hiding air-vents or something else remains to be seen. A GT3 front bumper, center-mounted twin exhaust pipes and a fixed rear wing round out the changes on the new 991-era GT3. A bigger rear wing is expected to make it onto the production version.